Click on the thumbnails below to watch the videos! Want to be part of a positive environment and join a team where you will gain a high level of experience and mentoring from the start? Looking to find colleagues who will support you in a collaborative effort? Summer Associates at Williams Mullen can expect an experience quite similar to that of a first-year associate at our firm. The summer program experience entails most aspects of associate life, including challenging assignments, knowledge and skills development programs, and social interaction with associates, partners, and staff. Through supervising attorneys, summer associates receive varied assignments as well as in-depth feedback. Associate mentors and supervising attorneys are paired with the summer associates based on personal and professional interests. Weekly practice briefings are conducted with attorneys from each of our major practice groups to supplement the work experience and provide a broader exposure to the various practice areas. Partners also play a prominent role in the Summer Associate Program by attending summer associate social activities. Partners get to know our summer associates on a personal level. At this time, Williams Mullen has elected not to sponsor candidates for immigration visa status. A summer associate's rotation is influenced by his or her interests that are gathered prior to his or her arrival. In Richmond, a rotation period will last two weeks and one attorney will act as the summer associate's supervisor for each rotation. In Hampton Roads and Raleigh, there is no formal rotation but students will receive assignments from multiple practice areas and have opportunities to gain varied experience. How many hours do summer associates work? 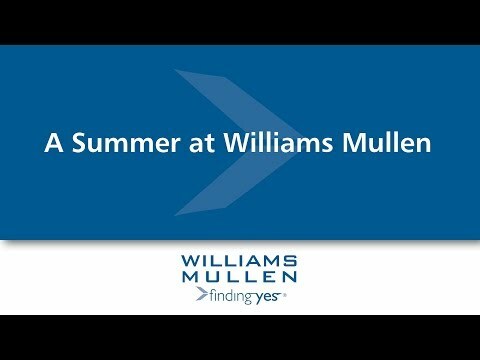 Williams Mullen expects its summer associates to work in conjunction with each office's operational business hours. Supervising attorneys and the talent management team monitor summer associates' workloads to keep their productivity within this expectation. Summer associates receive both billable and non-billable work and are expected to produce work product timely. Summer associates do not have billable requirements; although, when appropriate, clients are billed for their time. What will I be expected to know when beginning the summer program (e.g., skills, qualities, recommended classes to prepare for summer, etc.)? The attorneys at Williams Mullen recognize that summer associates generally do not have extensive experience in the subject matters of the firm's various practice areas. As a result, attorneys who assign work to summer associates provide them with the necessary substantive background to complete projects. Also, our knowledgeable library and research staff guide and assist summer associates throughout the program. Summer associates are expected to use their general legal skills, such as analytical thinking and research, which they have learned in their first-year and/or second-year law school classes. Once a summer associate completes and submits a project, an electronic evaluation is sent to the assigning attorney. A recruiting committee contact, in conjunction with the Talent Management Department, facilitates the feedback process via mid-summer and exit reviews. Summer associates also routinely receive informal feedback from attorneys throughout the summer.